Giuseppe Verdi often took strong political stances in his operas, and Rigoletto is no exception. Based on Victor Hugo’s scandalous play Le roi s’amuse, which was banned for its open criticism of the loose morals of the royalty, the Maestro’s famous opera tells a gripping story about debauchery, double standards and revenge. 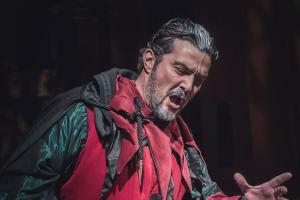 The intense plot and Verdi’s inspired music make Rigoletto a favourite, and the intimate performance at St Mark’s Anglican Church in Florence lets you get right into the opera’s exciting and twisted plot. The scaled-down arrangement of Rigoletto that plays on the elegant and cosy stage of St Mark’s helps the opera’s defining dramaturgical and musical characteristics move to the forefront. When the Maestro’s elaborate orchestration is reduced to a moving piano accompaniment, the themes and counterpoints ring more clearly. The ensemble of six talented singers working within a smaller space tackle the rich and varied characters with greater zeal and deeper focus. This performance is a fantastic opportunity to get up close and personal with one of Verdi’s classics. Ever since its premiere on 11 March 1851 at Venice’s Teatro La Fenice, Rigoletto has been a fixture in the operatic catalogue. Its titular character, a hunchback jester in the court of Duke Mantua, makes his living by ruthlessly mocking the victims of his master’s adultery. While he ridicules the courtiers whose wives and daughters the Duke has dishonoured, he deeply cares about the chastity of his one daughter, the beautiful Gilda. When Mantua sets his sights on the young girl, Rigoletto faces a hard decision, and this is where the jokes end. Verdi, along with librettist Francesco Maria Piave, did a splendid job adapting Hugo’s incendiary play for the operatic stage. While they preserved the work’s political charge, they also dressed it in some of the best music and dramatization the genre has known. The Duke’s aria ‘La donna è mobile’ or the quartet ‘Bella figlia dell’amore’ display Verdi’s immense talent for melody and characterisation.